The best dovetail jig in the world. Flawless joinery is the hallmark of a woodworker’s dedication and skill, and with the Leigh D4R Pro Dovetail Jig, your work will take on the unmistakable look of a craftsman. 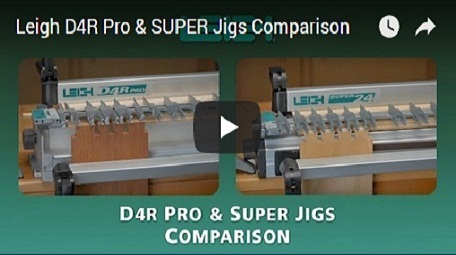 The Leigh D4R Pro is the most versatile and user-friendly dovetail joinery jig available, and with it, you can create perfect joinery of all kinds: through dovetails, half-blind dovetails, sliding dovetails and box joints (finger joints). In just minutes, you can rout equally or variably spaced through and half-blind dovetails, not possible with template jigs. No other dovetail jig offers the incredible range of joinery than that of the D4R Pro. Rout all types of variably spaced through and half-blind dovetails, as well as single pass half-blind dovetails and box joints (finger joints), all using the standard dovetail finger assembly. Two sizes of box joints (finger joints), 3/8" and 3/4"
Adds a unique touch to any woodworking piece. Rout in a fraction of the time it takes to hand cut them. Only the tails need hand cutting. Attach an optional template to your D4R Pro for even more unique joinery styles. 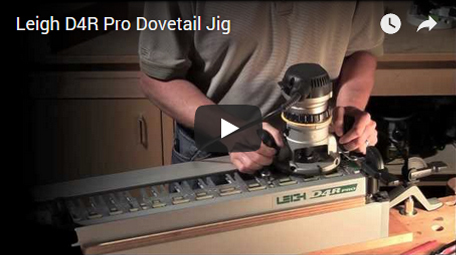 The Leigh D4R Pro Dovetail Jig makes it easy. Position the guide fingers to your desired pattern, and with the boards in place, simply guide your router around the guide fingers to rout the dovetail joint. One finger assembly makes a multitude of joinery. The D4R Pro is Leigh’s premium dovetail jig, designed for use by woodworkers of all levels. Leigh has made perfect joinery easy in every way, from thorough, step-by-step user guides, bulletins and how-to videos, to customer service second to none, with instant toll-free technical support and help line.